Few people have had quite as much influence on the way Americans learn the history of this country than Laura Ingalls Wilder, author of The Little House on the Prairie. For decades, since their publication during the Great Depression, her books have been a fixture of American childhood, particularly for girls. They paint a rosy picture of white settlers as heroic strivers, and her work, too, is more heavily fictionalized than its popular perception generally recognizes. 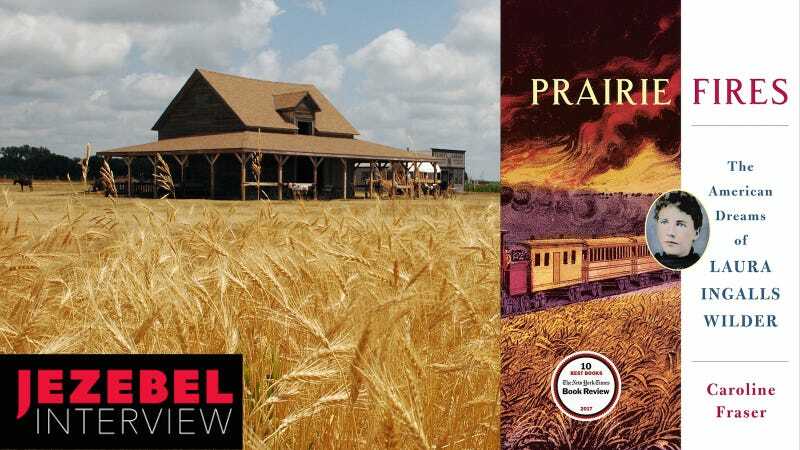 But as it turns out, a close examination of her life and the creation of the books she loosely based on it makes for a fascinating, clarifying lens on a much-mythologized chapter of American history—as Caroline Fraser proves with her recent biography of the author, Prairie Fires: The American Dreams of Laura Ingalls Wilder. Fraser’s book examines Wilder’s life and the wider context in which her family went west, one of many families attempting to succeed as homesteaders, comparing it to the reality-adjacent version beloved by generations of schoolchildren. For instance, while he “proved up” on his homestead outside De Smet, Wilder’s father eventually sold it and moved into town. After facing financial catastrophe on the prairie—Prairie Fires is full of stories of awful, inescapable debt—Wilder and her husband Almanzo moved to Missouri and spent most of their lives there. The book is also tremendously resonant with our historical moment. It thoroughly deconstructs the over-simplistic image of the American homesteader, hewing success from the prairie soil. As Fraser traces in the book, the Dakota boom was a disaster for many, many of the individuals and small families who tried to make a go of it—a great way to rack up debt attempting to cultivate land that just couldn’t sustain the farming practices people were attempting on a wide scale. This history challenges the entire “pioneer spirit” narrative embedded in the idea of “Making America Great Again.” Fraser also traces the politics of Wilder and her daughter, Rose Wilder Lane, an incredibly conservative libertarian, providing the backstory on current right-wing talking points. I spoke to Fraser about the biography. Our conversation has been edited for clarity and length. JEZEBEL: How did you end up writing a biography of Laura Ingalls Wilder? CAROLINE FRASER: As a kid I was a fan, like millions of other readers, and I knew that my grandmother had a whole farming history in the Midwest, in Minnesota, so it also was really fascinating to me because of that. In fact, I remember trying to ask her about stuff from her childhood, and her answers were interesting, because she was so reluctant to talk about it. It was clearly a really difficult time in her life. It made me curious about what the real story was, I guess. Because the Little House books are full of natural disasters and can seem dark at certain points, but you get a really strong feeling that things are going to work out for the best. And clearly, in my grandmother’s life, they hadn’t. As an adult, about 20-some years ago, a guy named William Holtz published a biography of Rose Wilder Lane, in which he argued that Rose was the true author of the Little House books, not her mother. There were all these headlines in the newspapers about “little fraud on the prairie,” basically just saying Laura lied and Rose is really the author. That made me very curious and kind of skeptical, because I wondered what his evidence was for that claim. I wrote a long review and looked at some of Laura’s original manuscripts and found that his evidence was kind of thin. And I grew to feel that he really hadn’t come up with the goods on that issue. Also, I found his book remarkably dismissive, often of both women but especially of Wilder. That was my introduction to it as an adult. I ended up editing the Library of America edition of the Little House books, and I became really interested in the history behind a lot of the references and behind her life and really felt like it was time for a new biography that might re-examine some of those questions that Holtz had originally brought up. Your book traces the history of how these books have been packaged. But I think people still have this perception of them as autobiography. For people who haven’t read your book yet: how true in the final analysis would you say that that is? They are novels. They were published as novels. And the original editor, Virginia Kirkus, who would go on to start the Kirkus Reviews company, went into this question apparently with Wilder very early on and asked her: it was our impression that these are autobiography, what are they? Unfortunately, we don’t have the letter that Wilder wrote in response to that. But clearly, Kirkus determined that they were fictionalized enough that she would have to publish them as novels. And so they were. Obviously, they’re autobiographical, and they do the very unusual thing of treating the subject of the autobiography in the third person. Wilder is writing about herself in the third person, and writing about her real life, and using her name and her family’s names and the names of all the people who live in De Smet, who were all real people. That’s really unusual. So there’s no wonder that there’s been so much confusion. And of course, Wilder and her daughter contributed to that confusion by insisting that everything in the books was true, while knowing full well that it wasn’t. They knew and had long discussions about how to fictionalize material in the books. The books are in many ways remarkably accurate, as to certain types of detail, especially things that Wilder remembered about how her father built a log cabin and how he made bullets and how her mother made cheese and butter. All of those very specific descriptions she made as accurate as possible. And she had some little research projects where she attempted to find out, for example, the name of the Indian chief that she remembered from Kansas. But there were other things that they fictionalized—the chronology of her life was altered and certainly the trajectory of their lives. Because, I think, the reason she wrote the Little House books—and she said this—was to memorialize her parents. Her parents were beloved to her, especially her father. She idealized them, really. And the Little House books present an idealized view of their lives in some respects, especially her father’s farming career. So she tends to leave out certain details that are either distressing or sad or don’t reflect well on her parents. Anything having to do with debt or death—scholars have pointed out that there are no deaths in the Little House books, whereas in fact, her little brother Freddie died as an infant. Looking back on it as an adult, knowing what I know as an adult about money and the history of the West—you can almost see where the details got scrubbed out. I think the most interesting example is the stuff about Laura working as a child. I remember very clearly the stuff about her getting her teacher’s certificate, but when that’s her one story of working, it has a very different gloss than spending a lot of her late childhood working to help support the family financially. That’s totally not part of the story of Little House. But now that I’m looking for it, I can see the ghost of it. Definitely—the experience of reading the books as an adult is very different, because you can, as you say, see where maybe things were glossed over or left out, and you can also see the peril that they were in much more clearly than a child would. What I recall from reading them as a kid was this sense that everything was working out, and at the close of each volume, you felt a happy sense that the family was in a good place and nothing too terrible was going to happen. Reading them now as an adult is very different. You see a lot of the darkness that was there and the struggle—you can kind of infer it or read it between the lines. One of the other things that really struck me was how much context is stripped out. These books were very culturally influential and a lot of people get their idea about what it was like to be a homesteader from Little House on the Prairie. And reading your book, it was really interesting how much context has been stripped from the reality of that experience. Pa’s life story is a story of failure and hardship and you don’t get that impression from the book. And what you also don’t get it is that it was almost impossible to succeed as a homesteader. Most of the success stories were corporations or collectives, right? Right, or very large operations, the forerunner of today’s corporate entities. It is quite striking. And I think maybe some small part of that was because Wilder, at the time that she wrote the books, was assuming a certain amount of knowledge on the part of the readers. But I do think that a lot of it was that she just did not feel that the reality was always appropriate for children, and again, the factor that she really was aiming to idealize her parents and present this glowing portrait of them. So, none of the stuff about the debts, and particularly that period of time when they were in Iowa and then returned to Walnut Grove, when she was working at the hotel. That whole period has a very aimless quality to it. Her father clearly was struggling to put together enough odd jobs to get by. They didn’t have their own land. Wilder really leaves out of the story what happens with Charles Ingalls’s homestead in De Smet. She never really says, oh, well, he proved up but then ended up selling out. It’s striking how little she writes about her parents in that final manuscript. Which of course was never prepared for publication, and so who knows what would have happened if she had finished it. But she fictionalizes his story enough so he sort of fades out in a rose-colored view—you have the sense he succeeded as a homesteader. In fact, that’s not really true. The Great Depression and the New Deal results in exactly the same kind of rhetoric, politically, that we see now. I found the stuff about the Dakota boom really fascinating. It’s interesting the point you make about how she would have assumed a certain amount of knowledge on the part of adults and was filtering it for children. But people read these as children, and then they grow up and the image is intact, because they don’t have the life experience to know otherwise. It’s really striking to read about the Dakota boom and how it just agriculturally wasn’t possible for it to be this land of milk and honey based on farming. And the image of the boosterism in the face of the physical realities of the landscape, and then all these people fund this lifestyle based on credit—and I’m reading about the background to Little House but it feels like I’m reading about subprime mortgages in Florida. You know what I mean? It is striking! And I felt that throughout, writing about the Dakota boom and the government and the railroad colluding and suppressing information about the climate. They knew this. Their own scientists had told them this. And what does that remind us of, in today’s issues with climate change? You just have this weary sense that we’re repeating the same mistakes over and over again. And this is especially true, also, of the whole period of the Dust Bowl and the Great Depression, because they hadn’t learned the lessons that they should have learned from the drought in 1894. So they just let all these people go out to the southern Great Plains and strip all the topsoil off. And then within a very short time, just a few years, you know, they’re reaping the whirlwind. The Great Depression and the New Deal results in exactly the same kind of rhetoric, politically, that we see now. The divisions between the Republican denial of climate change and any kind of real-world scientific analysis of the problem. And so, again and again in Wilder’s life, one of the things that are really interesting about it is you see these patterns unfolding again and again and it’s discouraging. But it’s also I think really important for people to know. It seems like a lot of suburban development that’s ecologically unsustainable is driven by pointing to this myth of every man on his land with his homestead. Pointing back to this golden age. Then you look back to the facts of this alleged golden age, and it’s actually a con. Here in the West we’re still mired in these debates about grazing and how much cattle the land can support, and this is what gives rise to people like the Bundys, the whole incident a couple of years ago in Oregon, where there are all these folks that are protesting their grazing fees and don’t want to have any connection with the federal government. That all started with the New Deal. When you read Rose Wilder Lane’s rhetoric about the New Deal and how kind of crazed she became on the topic and came to feel that it was a complete violation of the Constitution and where the country should be going—the stuff that she said could be coming right out of the mouths of these ranchers who are protesting now. It’s fascinating to read her letters, because you could encounter her being completely unhinged in the comment section of an article now! You talk about how Rose becomes this very aggressive arch-conservative, and her mother becomes more conservative, too. How shaped were these books by the politics of these two women? Laura Ingalls Wilder writing the books, and Rose Wilder Lane helping her to shape them? I think Rose did insert some of her libertarian philosophy in at a couple of junctures, especially the famous Fourth of July scene in Little Town on the Prairie. But I think it was limited largely because Wilder was less taken with that. Not that she didn’t agree with it—I think she totally agreed with it, and she allowed her daughter, for example, to insert the Fourth of July which was very different from the one that she wrote. However, I think that Wilder was quite devoted to presenting her memories as she, presenting her life as she recalled it, and so I don’t think she was really open to a lot of fiddling by Rose. You see this in her editorial comments to Rose in letters and corrections that she made. They represent a kind of triumphant view. When in fact the reality probably wasn’t triumphant at all. It’s very interesting as an adult to look for these brief moments—there’s another Fourth of July scene in Farmer Boy that’s interesting in this respect. But I don’t think they really take over the work, and I think kids would just completely have not seen that at all. Unlike the Narnia books— when I read them as a kid, I knew even then that the author had a specific Christian agenda, behind the fact Aslan was Jesus, and that was just so obvious. Whereas I don’t think it’s at all obvious in the Little House books that Rose had a libertarian agenda—which isn’t to say that she didn’t try to use the books after they were published for that agenda. She did. She would often talk about them and recommend them to her libertarian cronies as an example of the great American spirit of doing everything by yourself and self-reliance. I’m not so sure that message comes through to the original audience of the books. It seems like in many ways it’s obviously a very conservative document just because it’s a story of the American settlement of the West that focuses on white Americans. But it’s interesting that it’s conservative but not necessarily polemical. Right, and I think when you’re talking about manifest destiny, that’s a whole different story. Because clearly, Wilder saw the world in those terms. She saw the frontier as the right of white people to settle. And so that does come across clearly in a lot of moments, especially in Little House on the Prairie, where the character Laura is talking to her mother asking, why did we come here if you don’t like the Indians? And the parents reply that this is for white people to settle, because we’re going to do something useful with the land. That is unquestionably present in the books, as are the stereotypes and racism regarding Indians. That I think is a separate issue in a way, because I don’t think she saw that as anything to do with libertarian political beliefs. That was just a foundational part of life for her, and it comes through quite clearly. Why do you think these books have captured the American imagination so completely and have had such a long life? Well, in part because they describe a part of our past that we have a lot of persistent fantasies about. They’re our origin story, in a way, because they’re about the frontier. They’re about the settlement of the West, even though she ended up spending most of her life in the American south—but that’s another story. They treat this whole chapter of our past that we love to feel was a tremendous, ringing, glorious success—homesteading and the settling of the frontier, and by “we” I mean white Americans. There’s a succession of figures in our past that we have transferred these fantasies to, Daniel Boone and Davy Crockett and various fictional characters as well, and I think that Wilder represents one aspect of that. For people like me, who knew that their ancestors and grandparents came and farmed and had similar struggles, they represent a kind of triumphant view. When in fact the reality probably wasn’t triumphant at all. I think we cling to these figures because they make us feel better about our past. Obviously, we now know differently. We know that the reality was far more complex and that many of these figures were not as wonderful as they were made out to be. But it’s the same phenomenon with Hollywood westerns, that there are just certain figures that John Ford or whoever created, John Wayne, that we just love to think of as embodying the American spirit or the American dream. But Wilder, as with all of those other figures, I think we need to take a closer look.